If you’ve been reading this blog for awhile, you know that last October I took a Top 100 Golf Road Trip throughout Wisconsin and Michigan. The goal was to knock off as many Top 100 and Top 100 public courses as possible – I ticked off 14 total on the trip. Well there was one round on the trip that was effectively a bonus round: The Lake Course at the Olympic Club in San Francisco. Yes, I get it, California is nowhere near Michigan. However, my girlfriend was running the Nike Women’s Half Marathon, so I flew directly from Milwaukee to San Fran to cheer her on. Her cousin AJ is a member at Olympic, and without me even asking he booked us a tee time for Saturday afternoon. The Olympic Club was founded in 1860 as San Francisco Olympic Club and is regarded as the oldest athletic club in the United States. Along with the championship Lake Course it also has the more user friendly Ocean Course and a 9 hole par 3 that I’ve heard fantastic things about known as the Cliffs Course. As with any exclusive private club guest tee times can be hard to come by, so we were slated for a 3:30pm start – probably not enough time to get a full round in. We showed up early, and were greeted with a huge surprise: there was no one on the course. At 2:30 the starter told us to get out there and that we’d probably be able to finish up the round. 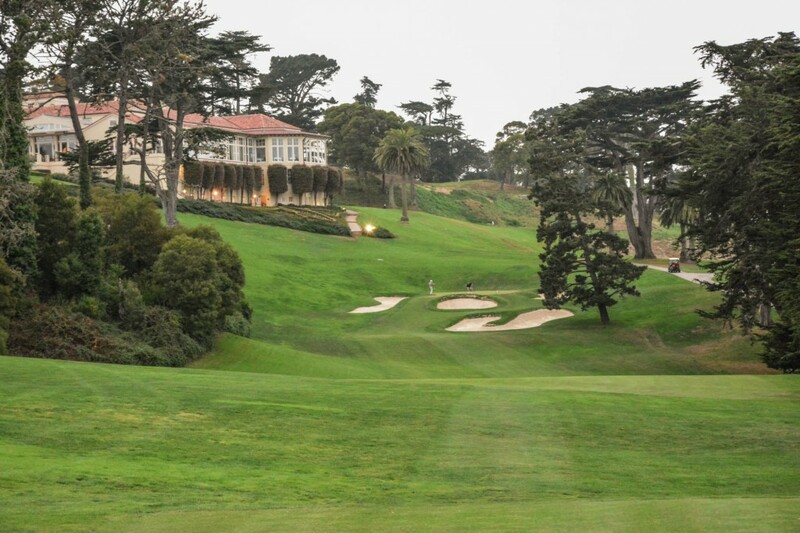 The first thing you notice when pulling into the Olympic Club is the terrain. The Lake Course is built on the side of a seriously steep hill, and the clubhouse looms over the 18th green – you almost wonder how it hasn’t fallen down the hill after all of these years. We opted to take a cart, but while the green to tee transfers aren’t bad, you will definitely get a work out should you choose to walk the course. The second thing you notice is that this truly is historic venue. Everything from the architecture to the landscaping was a complete 180 from courses like Oakland Hills and Medinah that I’d played the week before. AJ and I stepped up to the first tee and were joined by a local doctor in town – and I was more than a little nervous considering we decided to forgo the warmup in favor of trying to get a full round in. My two playing partners bombed their drives down the center of the fairway – me? That seemed to easy. I decided a hard snap hook into the parking lot seemed like a better bet. There was about 3 seconds of terror as I waited to hear if I broke the windows of the tandem of Ferrari’s parked in the lot. Yeah, I never said I was that good. Fees: Private. I paid around $140 total. 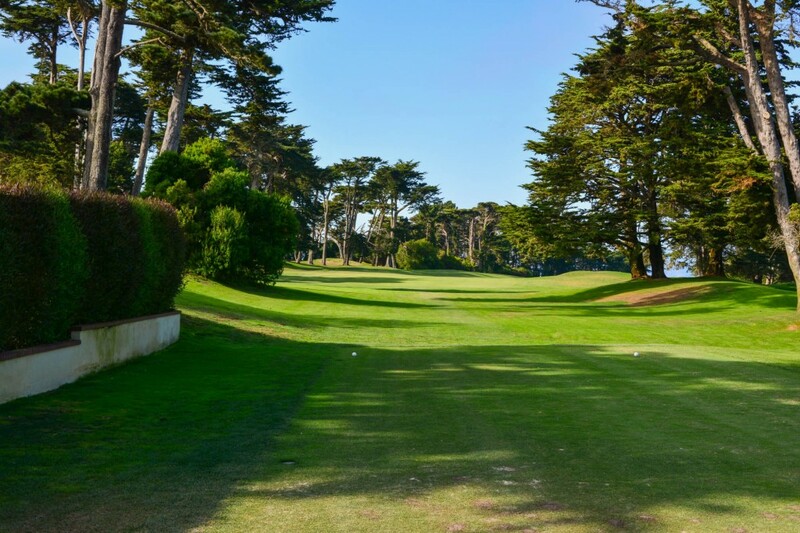 Without a doubt the Olympic Club was the most difficult course for me to photograph of all the courses I’ve done so far. Between lots of treelined fairways, a rapidly changing late afternoon sun, and playing quickly – it resulted in something other than my best work. So bear with me on that. Course conditioning also wasn’t perfect the day we played, but it was pretty late in the season, so it was nothing I wasn’t expecting – and the greens were still in great shape. Anytime you step up to the first tee of a new course, especially one with the prestige of Olympic, you’re intimidated – as noted by my story above. However when you consider that it’s hosted the US Open FIVE times (as well as three US Amateur’s) it takes your nerves to a whole new level. Normally I’m kind of a wuss and play from the white tees – but we stepped right up to the blues (6,597 yards), so yardages are from there. Keep in mind, this is a Par 71 course, so it’s even a bit longer than it seems. It was one thing to watch the 2012 US Open on tv, it’s an entirely different to be sitting at the first tee box with a narrow shoot of trees forcing you to hit a good drive to start off. The first hole is a mid length par 5 with a dogleg right (this hole was played as a par 4 in the US Open). There’s an interesting stand of bunkers about 60-75 yards out on each side of the green that I expected to be closer to the green. One thing I also noticed was a lack of extreme green shapes. After just playing some Dye courses like Whistling Straits and Blackwolf Run, I’d seen a lot of more modern and wild green formations and complexes. Here many of the greens were pretty round and medium sized, with lots of scary bunkers to stand guard. This is the first time you really notice that the Lake course is essentially built into the side of a hill. The first 1/3 of the course essentially has you zig-zagging down the hill. 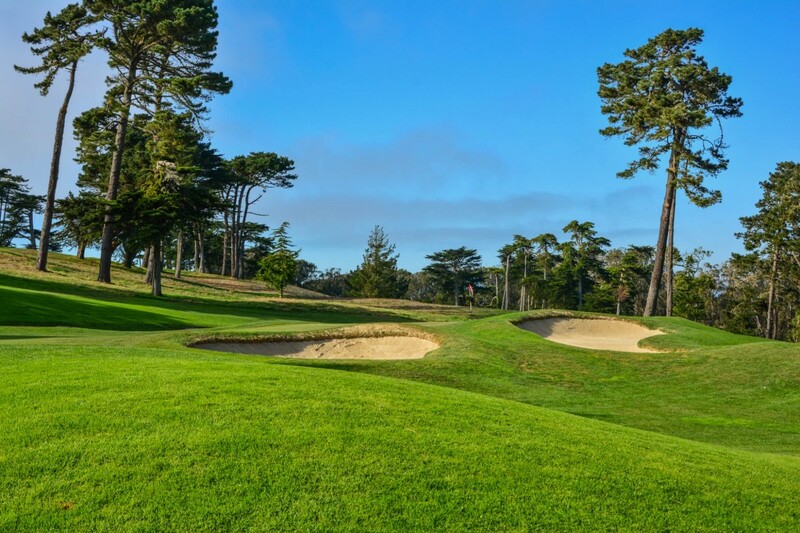 So not only do you have trees to contend with, but the fairways are all severely sloped so even a slight fade or draw can end up farther down than expected – and at best you’ll have a fairly uneven lie. The first one shotter on the course was definitely a memorable one. Long and downhill, you can see the city peaking out over the trees and even the top of the Golden Gate Bridge in the background. That being said, due to fog, I’m not sure how often you can actually see that far. We got extremely lucky in that we had a beautiful 60 degree day in October, with an empty course. Thank you golf gods for that one. I must have been distracted by the views however, because I hacked this one up for my third double in a row. Make sure you hit the range before playing this one. 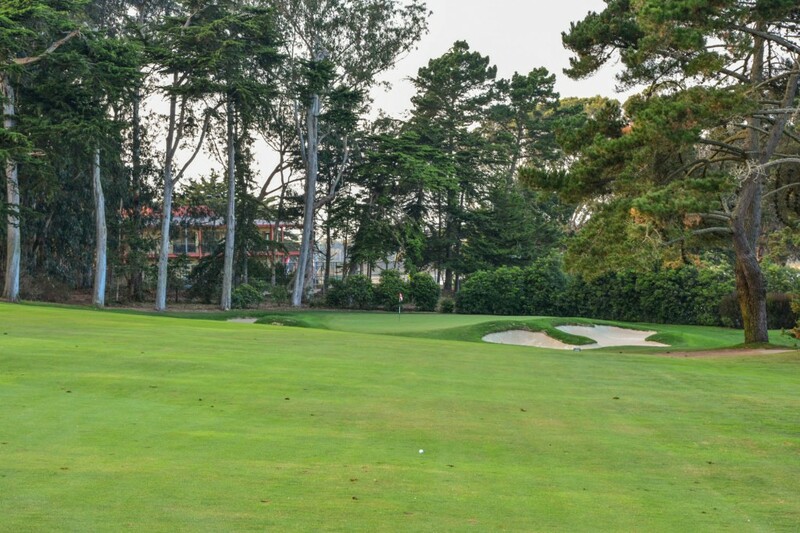 If you tend to slice, the long par 4 4th hole is a killer. There’s a tall tree on the right that makes it extremely difficult to try and cut off the corner, and if you slice it hard and right you’re going to be hard pressed to hit the green in two. At 417 yards its a long hole, but when you factor in the approach shot that’s straight uphill, you could be in for some trouble. After a potentially brutal hole 4, 5 is an even longer par 4 that is the #1 handicap hole on the course. That being said, it’s more downhill and is a dogleg right – so it’s got that going for it. Guess what?! Another long par 4! I’m generally not an extremely long hitter, so that made this stretch of holes extra difficult. Not only do you need length, but with so many trees accuracy is a must as well – so if you want any shot at a GIR you’ll probably need to forgo the 3 wood or hybrid. That said, this is where my round slowly started taking a turn for the better as through 5 I was 10 over. One of my favorite holes on the course: a short par 4. I missed short and right, however AJ stepped up with driver and knocked it dead on the green. This has been his home course since he was little, and he said that was the first time he’d ever done that. It’s also pretty cool to start playing directly beneath the clubhouse to the left of the green. My favorite hole on the course. A mid range par 3 that plays slight up hill, with a couple trees making a straight shot necessary. Guarded on three sides by bunkers and with the clubhouse looming overhead, teeing off here was definitely one of the more memorable moments of the round for me. I’d been hearing about the “burger dog” for months before playing here. It was time to experience it for myself. Because it was getting late and they were going to close down shop, we popped over to the halfway house and grabbed our long thin burger that was served on a hot dog like bun. It goes hand in hand with Oakland Hills home brewed bourbon barrel aged IPA as my two favorite food or drink items at a golf course. #9 is the fourth par 4 over 400 yards we’d played on the day. Here’s a view of the green complex. This is where something changed for me. I was pretty disappointed by the 49 on the front, but I went on a tear and parred 4 of the next 5 holes – which is pretty good for me. I don’t know how it’s possible but the back is actually longer than the front, even though with the exception of 16, it feels a fair amount shorter. The 10th is a dogleg right par 4 that is under 400 yards (although not by much). Another long par 4 with a slight dogleg right. The green has bunkers guarding both sides, so an accurate approach is a must. However if you must go in one of the bunkers, avoid the one on the right. It’s deep and the green has a pretty steep right to left movement that makes stopping the ball out of there no easy feat. This was one of my favorite holes on the back 9. Another par 4 with a narrow shoot of trees that goes to a slightly uphill fairway, followed by a downhill approach to a green tucked back in the trees. One of my favorite approach shots on the course. 13 is a relatively flat hole with a giant bunker you have to carry in front of the green. Take an extra club as this is a place you don’t want to be. A long dogleg left par 4. If you can crank your drive you’ll find yourself getting a nice downhill roll and giving you a wedge or short iron to the uphill green. I didn’t have so much luck. I ended up right off the tee giving me a tricky long approach that I stuck about 20 feet away resulting in one of my prouder moments of the round. I think 13 and 15 are the two par 3s that feel most similar in that you have three bunkers guarding the green on the left, right and front. The difference is this hole is much shorter, and the bunkering is even more severe. Holy crap. This hole is borderline unfair. Easily the most difficult hole on the course (and that’s saying something considering the bevy of long par 4s). For those of you who watched the US Open in 2012, this is the hole where Jim Furyk lost the tournament. It plays from an insane 670 yards from the tips, but they brought it up 100 yards to the same spot where we teed it up from. The huge change caught him off guard and he snap hooked it into the trees to cost himself the tournament. As someone who can’t hit a draw to saves his life this is a pretty scary tee shot, and then it just gets looooong. One of the most difficult holes I’ve ever played. You have a chance to redeem yourself here, as it’s another par 5 that is considerably less lengthy at 491 yards. That said with an uphill green and severely sloped fairways, like every hole here, it’s no slouch. A fantastic finishing hole. A shortish par 4 that, like #8, has the clubhouse looming above you as you come in from your round. AJ was telling me that during the tournament there were people packing the hill above the green, and due to the wet weather there were more than a few sprained ankles. A unique, and fun finishing hole. We finished up right before dark (the photos make it look much lighter than it was), and then headed to the mens locker room for our obligatory post-round drink. This was unlike any locker room I’d ever seen. First you notice the swimming pool inside the men’s room, and then the mens bar was without a doubt one of the nicest I’ve seen. Not to mention the bartender made a mean manhattan that was so big it came with it’s own sidecar – I’d highly recommend giving it a shot if you make a visit here. The course was every bit as difficult as I expected it to be, and it’s very clear why it’s been chosen to host so many US Open’s – it’s one of the best tests of golf I’ve ever faced. My only wish is that I would have had more time to explore the grounds, hit up the range, and perhaps play one of the other two courses as well. Every played the Lake Course? What did you think?? 15 is one of the better looking “short” holes i have seen. Generally not a fan of up hill one shotters, but that hole is genius. Congrats on getting to play. Love what you are doing. If around Richmond, Va and looking for a game, hit me up.